The average roofing installation price for a concrete tile roof costs anywhere between $20,000 to $40,000 depending on the slope, pitch, and size of your roof. You can expect to pay $3 to $5 per sq. foot or $310 to $500 per square installed on a standard sized single story home. Costs will vary depending on local roof contractor’s pricing. View your potential roof installation savings with local contractors below. It’s always smart to get price quotes from at least four local pre screened and licensed concrete tile roof installers before starting your roof replacement project in order to get the best price in your area on your concrete tile roofing installation. Labor Costs: Anywhere from $7000 to $10,000 for a 1500 square foot roof. Concrete Roof Life Expectancy: 50+ years. Lighter than alternative tile roof materials. 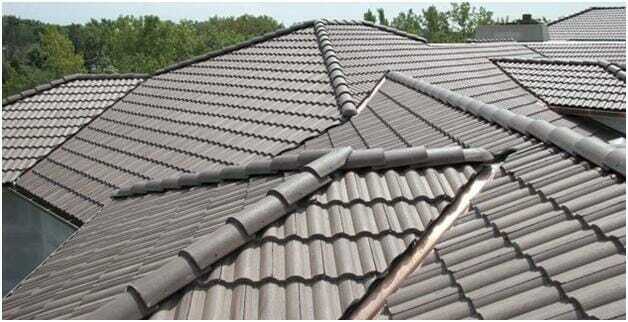 Concrete tiles are a popular, budget-friendly alternative to traditional clay roofing tiles. Concrete tiles have a long lifespan, require low maintenance, offer good fire protection (Class A rated), and are resistant to rot and insects. They are also considerably lighter in weight than clay tiles, preventing the structural problems often associated with clay tiles. Concrete tiles are extremely durable, and their strength is only reinforced by the interlocking mode of new roofing installation for concrete tile roofs. Degree of Roof Slope: If your roof’s slope is less than 18 degrees, concrete tiles may not be the ideal roofing material for your home in regards to water runoff and weight. Concrete Tile Weight: The heaviness of tile is something to think about as you approach this project. Tiles are more than twice as heavy as asphalt shingles, so unless your home has previously had a tile roof, you will need to have your home evaluated by a structural engineer. If your home needs additional structural support, this could increase the cost of the project by thousands of dollars. Concrete Roof Underlayment: One of the great things about concrete tile roofs is that they last for a long time. However, the roof underlayment beneath them isn’t quite as staunch, and it will need to be replaced every 20 years. Concrete tiles are also somewhat fragile in spite of their durability, so make sure you only allow experienced concrete tile repair men on your roof, even for a seemingly easy repair project. The good news is that when it comes to maintenance, the most you’ll need to do (unless the concrete tiles incur damage) is lightly rinse them once a year.